Once you have connected a keyboard and opened the game on your PC, make sure the keys sound notes when you press the keys, see help file for the sound trouble shooting guide. 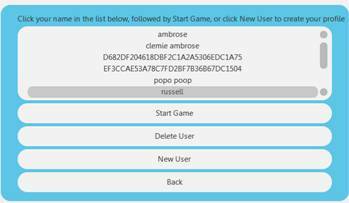 Start by creating your user name in "New User" then click on "Start game". 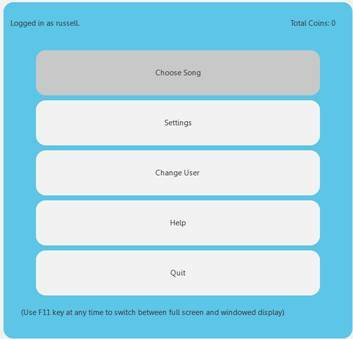 The next screen is where you choose a song to learn, click on "Choose Song"
Then choose a song from the "Choose a song menu". I suggest you start with an easy song such as "Twinkle Twinkle Little Star". The next screen allows you to choose various options. Click on "Practise this Song". The next screen is the practise screen; before you start make selections in the "Control" and "Settings" menus. In "Control" slow the music tempo to say 60 beats per minute (BPM) for now. 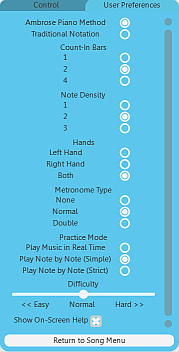 Select "Play note by note". When the correct key is pressed the note will sound, a green bar will light up and the music will move to the next note. If you press a wrong note a red bar will light up and you will not be able to go to the next note. Keep practising the Right hand until you are familiar with all the notes in the right hand track. Press space bar to return to the beginning and practise again. 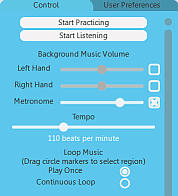 To play the tune over and over and again, select "Loop with count" in "Control" menu. 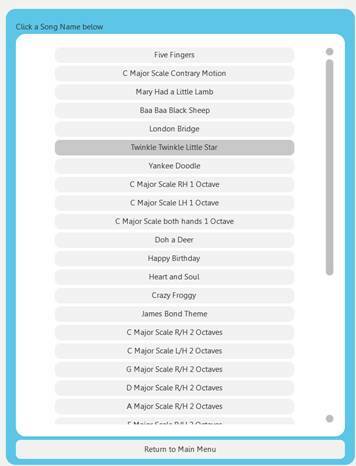 If you want to hear the left hand track as you practise the right hand select "Left Hand" background music volume, adjusts the volume. When you have practised in "Play note by note" and are confident that you know all the notes in both hands go to "Control" and select "Play music in real time". Lower the tempo to say 60 BPM, press space bar and see how you get on! 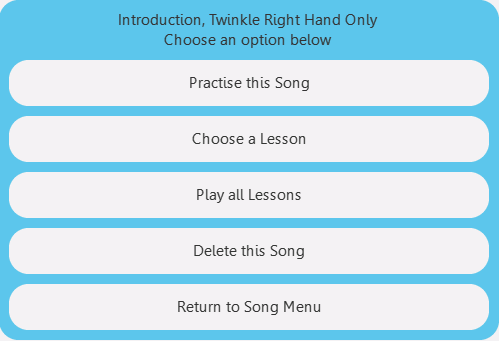 Start with the right hand with left hand background music, then practise the left hand. When you can play both hands separately try both hands together. When you are really good go back to song menu and select “Start game” and play the game for real.